There is a massive crime wave in North Bay Village and the baby Jesus has been kidnapped not once but twice. Police reports have been made but finding the culprit is not likely since while North Bay Village has an enviably low crime rate, we rank in the bottom third of M-D municipalities in solving those crimes that do happen. A third Jesus has been installed and as of this morning is still in place. The lights on Hispanola Ave were out because the lighting contractor the village chose did not account for the possibility of rain which is not rare in South Florida. They were back on last night and there is hope they might last through the New Year. So you see, it's really nobody's lack of oversight, just stuff. This seems as good a place as any to leave the old year behind. Yes, once again, North Bay Village has managed to screw it up. 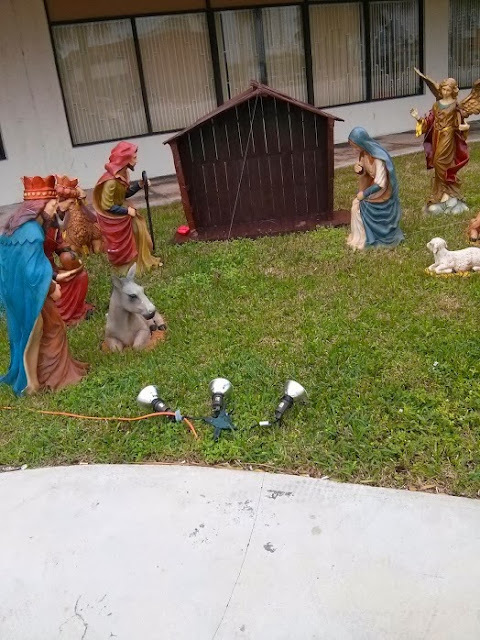 Our Holiday Creche, which cost $4,500, is a scene of the Holy Family, the Three Kings and some livestock staring at a blank space. The Holiday Lights which cost $35,000 - or the same amount as funding the PAL - did not make it through December 26 when Hispanola Ave. went dark. It's kind of a neat metaphor for how our city is being run. The key figures missing in action and it's just too much trouble for our mayor to keep her lights on. As Mr. Rollason and Mrs. Kreps enter the final year of their respective tenures, we can expect to see more darkness and disorder in 2014. But let's keep plugging forward - they won't be here that much longer and North Bay Village has a great chance at the end of 2014 to fix this. Let's look forward to it.